Data is from the November 2015 Crowdtap report titled "The State of Influencer Marketing." 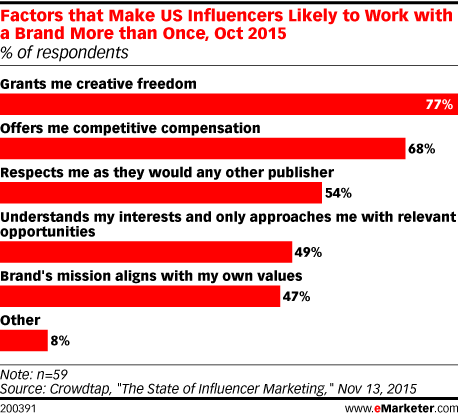 59 US influencers were surveyed during October 2015. Respondents were bloggers (81%), short-form content creators for Instagram, Snapchat, Vine, etc. (16%) and vloggers, or long-form video creators (3%). The aggregate social imprint of the blogger respondents was 248,000 followers. Respondents were drawn from Crowdtap's network of content creators.